My son saw this picture of ATV for kids yesterday and he told me he wish he could have it on his birthday. This electric ride is a 2 wheel drive (two 25w motors with a 12V battery), the speed is from 3 to 6 km/h, it has a rubber band on each wheel for longer wheel life and better traction even on grass, has two front speeds with reverse, and Under seat storage compartment. It has ATV Lights and sounds just like the real ATV.The price is around $280.00. 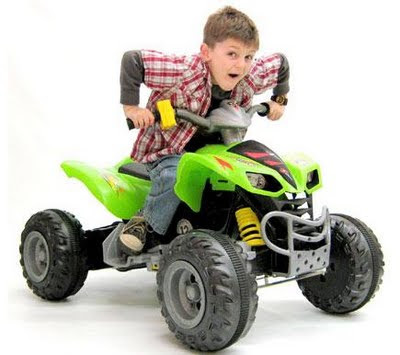 If you're looking for a nice birthday gift for your kids, consider giving them this ATV. I'm sure they will surely like it.